For those of you wondering what we are doing putting our 7-month-old on the potty, allow me to explain. Most parents learn that this happens, and have strategies to deal with it, such as letting the air hit baby’s bits and then covering them up again, quick as a flash, to absorb/block the pee. We noticed this too, and in fact were expecting it – but sometimes he was still too fast for us! Luckily, we knew what to do. Well, at least where to start. A good friend of mine had told me about the technique called “E.C.” or “elimination communication” – she’d read a book about it but felt her boy was too late to be starting. 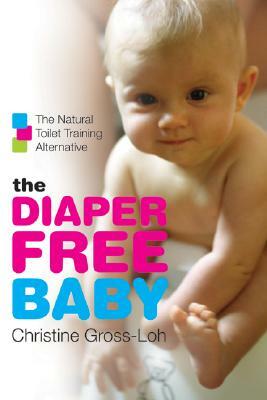 Sean and I got the book, The Diaper-Free Baby by Christine Gross-Loh, while we were pregnant. The idea behind this book, and the EC movement in general, is that babies are born with an awareness of when they’re peeing and pooping (“eliminating”), and that it is instinctive for them not to want to soil themselves. According to the theory, this is why babies pee when the diaper’s off. In lots of countries, EC is the norm: diapers are not readily available to everyone, so parents learn to read the signals that their baby needs to eliminate, just like we read signals that their babies are hungry, tired, etc. In this part of the world, instead of working with this form of communication, we generally train the awareness out of our children by diapering them all the time and expecting them to soil those diapers… and then we train it back in a couple years later. Some parents are really hard-core with this – their babies spend a lot of time undiapered, they have wool pads in abundance, they know lots of tricks. When E was newborn, I wanted to try what I’d read about, but felt overwhelmed by the idea of full-on EC. E was a very frequent eliminator. Then I was on an EC forum somewhere, and a mom had written that she just gave her daughter a “pottytunity” whenever she changed her diaper. That seemed do-able. So we got E a Baby Bjorn Little Potty when he was a few weeks old, and began holding him on it for a short while whenever we changed his diaper. Within three days, he had his first pee on the potty. YAYYY! The next day, we got another one. This continued and then became more frequent; pretty soon we were getting two or three pees a day in there, sometimes even a poop! It was very exciting. Who cared if it was kinda flukey (and flaky)? There were no more pee fountains, so that had to mean something. Sometimes he’s peed in big potties too; the first time was at the wedding of some friends of ours when he was not quite six weeks old! I was changing him in the washroom cubicle with the change table in it, and thought, No little potty, can’t hurt to try to big one… And he PEED IN THERE. I was so proud! Bonus: EC is cute. Right?? We’ve continued with EC this whole time. Some weeks we’ll get off-kilter and will hardly “catch” anything, but some weeks we get something for practically every chance we give him. Solid food threw everything out of whack for a little while, but now that he’s used to that, and it’s slowed down his system, I swear he is getting it. In the past ten days, only two poops have ended up in the diaper. His signals are stronger, and I think he actually waits and holds it for the potty: oftentimes we’ll put him on there and he immediately does his business. WHAT A SMART BABY. Just goes to show, most babies are much smarter than we realize, in more ways than we know. Oh, boy – this is the kind of blog post you will want to hide away before E turns about 5! Otherwise his friends will all find out about it and it will be a MAJOR source of teasing and embarrassment! We are almost finished reading the book and we are already having success, but like you, we we’re also committed to practicing Elimination Communication. The writing, pictures, and diagrams are exceptional and it’s like the Diaper Free cliff notes, but way better! I used your web form below to post the link – is that for resources or if I have my own site? They are so much smarter than we realize…I am amazed by this every day. I wonder if it’s too early/late for Naomi – she has always given very clear signals of doing a No. 2. Kinda reminds me of my delivery. Never too early or late! Just give it a try, nothing to lose. They say girls in particular tend to respond well – like they’re more sensitive to wetness or something?